Meet HERSHEY. 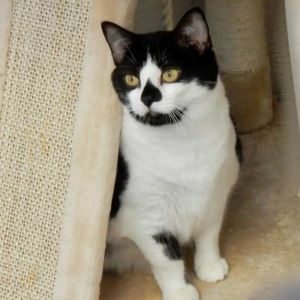 She is a BIG 3 year old black and white girl with striking yellowish eyes and unique markings. She is SWEET and AFFECTIONATE. Hershey was rescued from a high kill shelter in NYC and is anxiously waiting for her forever home. Come meet Hershey. She is staying in Long Beach, NY. She is spayed, UTD on shots, and FIV/FeLV negative.